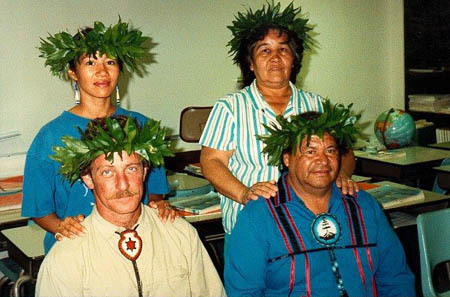 Mililani Trask with members of her family, Mili Hanapi and Zuleikha at the Tree of Peace planting, Volcanos National Park 1990. Hahai no ka ua i ka ulula‘au. The rains are attracted to forest trees. Knowing this, Hawaiians hewed only the trees that were needed. 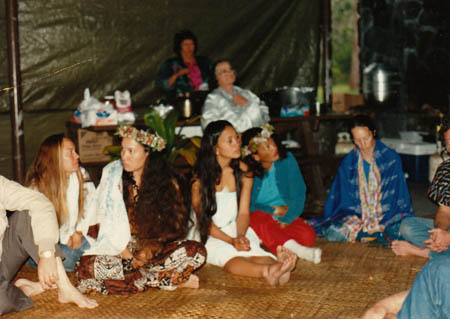 In 1989 Mililani Trask, attorney and then Kia ‘aina of Ka Lahui Hawai‘i, invited The Tracking Project together with Jake and Judy Swamp to visit the Hawaiian Islands for a series of gatherings and presentations which would initiate dialogues between Native Americans and Native Hawaiians regarding models for sovereignty and the need for peace. In February 1990 these gatheirngs took place. Mililani worked with Mili and Alapai Hanapi and many others to coordinate a weekend gathering for Ka Lahui representatives and guests in the Volcanos National Park. More than 50 people came together to take part in the all-day ceremony, which began with an awa ceremony conducted by Sam Ka‘ai under shelter during a heavy rain, after which Jake told the story of the Great Peacemaker. Offerings were made to Tutu Pele at the crater of Halema‘uma‘u and two yellow ‘ohia trees were planted in a large clearing just beyond the park boundaries in the bird sanctuary known as Kipuka Pua‘ulu. 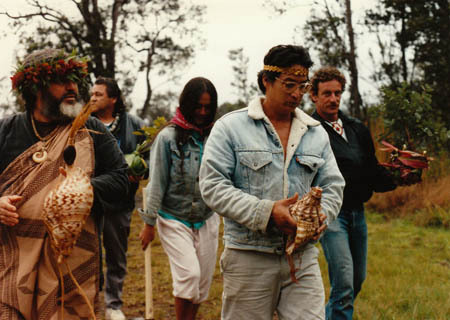 Sam Ka‘ai, Jake Swamp, Mili & Alapai Hanapi, and John Stokes with the tree, Kipuka Pua‘ulu, 1990. John Stokes and Alapai clean the awa, 1990. From the Big Island, the Swamps, Zuleikha and John Stokes traveled to the Kapalama campus of the Kamehameha Schools on O‘ahu. Several years earlier, Mililani had arranged a meeting between The Tracking Project and Kahele Kukea, then principal of Kamehameha Elementary School. Kahele had appreciated the “critical thinking” that accompanied the awareness of tracking and survival skills and so began a series of school visits which has continued from 1988 to the present (2009). 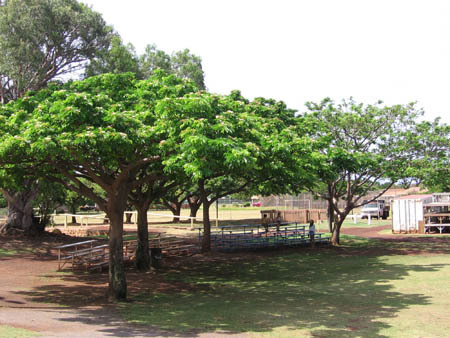 As part of the 1990 Tree of Peace tour, a yellow milo tree was planted on the Kamehameha campus next to the playing field of the elementary school with Kahele and about 100 members of the fifth grade class. 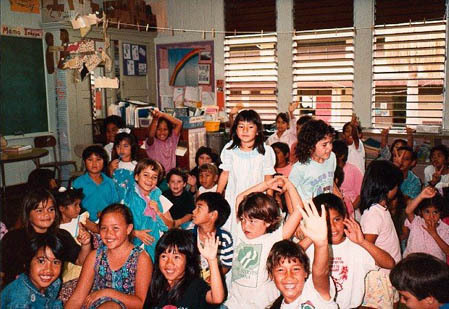 John Stokes, Jake Swamp, Kahele Kukea and the fifth graders, Kamehameha Elementary School, O‘ahu, 1990. 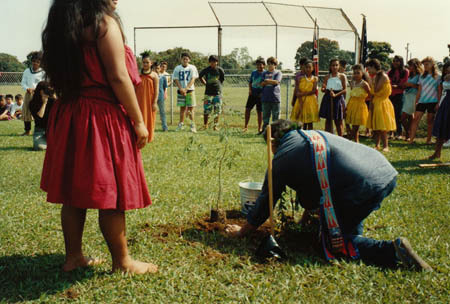 Kahele Kukea and John Stokes plant the Tree of Peace. Kahele placed an octopus beneath the tree for fertilizer, Kamehameha Elementary School, O‘ahu, 1990. At the Punahou School, the team performed for over a thousand students in three different assembly programs and in Kailua, Yuklin Aluli coordinated another ceremony in which a kukui tree was planted with 350 students of the Le Jardin Academy. 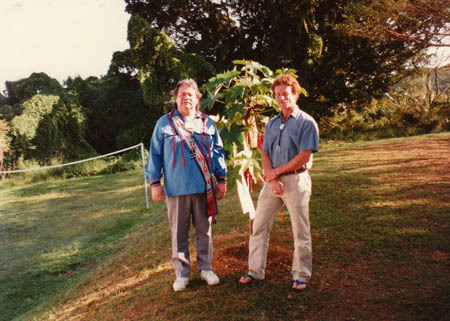 Jake Swamp and John Stokes with the kukui Tree of Peace, Le Jardin Academy campus, Kailua (near Ulupo heiau) 1990. In 1991 Tracking the Roots of Peace returned to the islands. This time, however, the backdrop for the cultural gatherings and tree plantings was Operation Desert Storm, which had begun just days before the team left for Hawai‘i and which “ended” just after the group returned to the mainland. Jake, Judy, John Stokes and Nancy Latuja visited Molokai, O‘ahu, the Big Island and Kauai. After attending Ka Molokai Makahiki in Kaunakakai, hosted by Walter Ritte and the Makahiki committee, the group planted a Tree of Peace at the home of Sam and April Kealoha. They then visited each of the four elementary schools on Molokai — Kaunakakai, Kilohana, Mauna Loa & Kualapu‘u — sharing their message of natural and cultural awareness with most of the elementary-age children on the island. From Molokai, the group traveled to the Big Island where they made a presentation to the students of Hale o Ho‘oponopono, an alternative school run by the Kamehameha Schools, and planted a Tree of Peace with the entire student body of the Keaukaha School in Hilo, complete with traditional hula, music and visiting dignitaries. The day after the ceremony was spent with the students of the Hawaiian language immersion program. The Swamps were able to share the news of the progress being made to recover the Mohawk language at the Freedom School, a Mohawk immersion program back in their home community of Akwesasne in upstate New York, with the Hawaiian immersion students and their teachers. 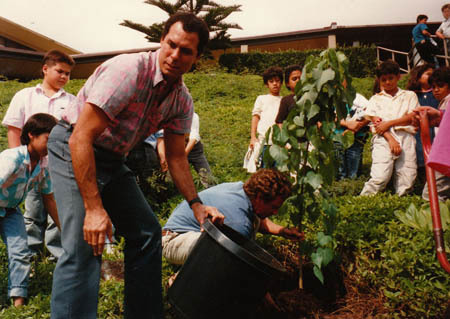 Jake Swamp planting a tree at the Keaukaha School, Hilo Big Island, 1991. Students in the Hawaiian language immersion program, Keaukaha School 1991. Nancy Latuja, John Stokes, Judy and Jake Swamp, 1991. Shortly after returning home from this second tour, John Stokes received a call from Walter Ritte. 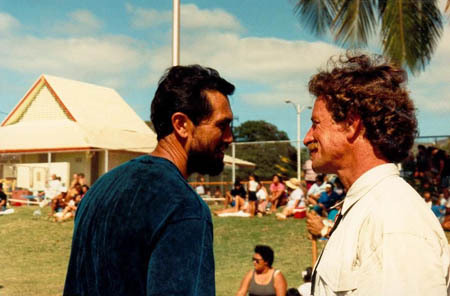 He had heard of the tree planting at the Kealoha’s house and he requested that the team return to Molokai the following year to plant a Tree of Peace for the entire community. He wanted the community to experience a ceremonial tree planting. 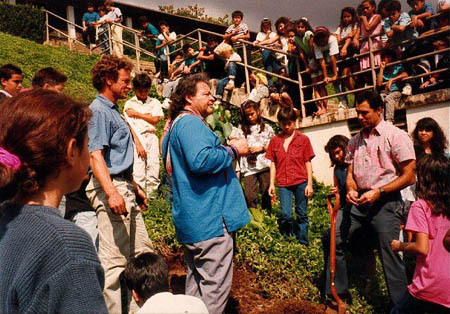 So in 1992, The Tracking Project sponsored a third visit for the Tree of Peace team. 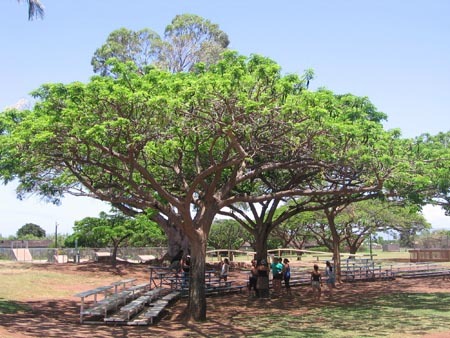 In a ceremony that included more than 350 people at the community center in Kaunakakai after the Makahiki games, Jake once again told the story of the Great Peacemaker and a monkeypod tree was planted for the community in the open area outside the community center building. Jake Swamp with the monkeypod Tree of Peace, Molokai Makahiki, 1992. 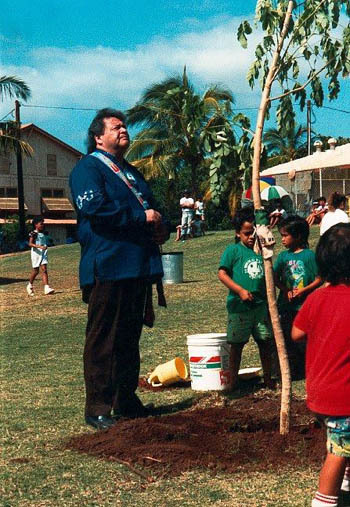 John Stokes playing the yirdaki for the Tree of Peace, Molokai Makahiki, 1992. 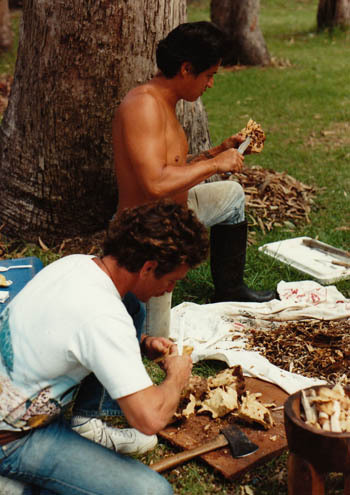 Walter Ritte and John Stokes, Molokai Makahiki,1992. Following our time on Molokai, we were able to re-visit the tree we had planted in 1990 at the Kamehameha campus on O‘ahu. Jake had noted that the trees once planted serve as gathering places and symbols for future peace events. The principal of the Keaukaha School had written us that when there was a need for a ho‘oponopono (peacemaking) session with her staff or students, she would conduct the session in the shade of the Tree of Peace. 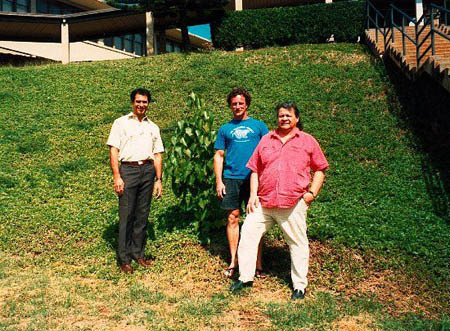 Kahele Kukea, John Stokes and Jake Swamp with Kamehameha Schools Tree of Peace, 1992. Over the next years, we continued to visit the trees we had planted. Over the next years, we continued to visit the trees we had planted — to water them, care for them and conduct further gatherings dedicated to peace. 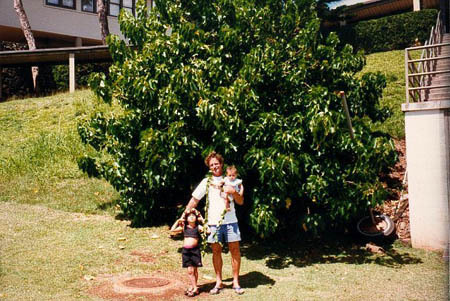 John Stokes with his children Jade and Kainoa, Kamehameha School Tree of Peace, O‘ahu, 1997. Jade Stokes visits the Kamehameha Tree of Peace, 1998. The trees planted at the community center on Molokai continued to grow nicely. 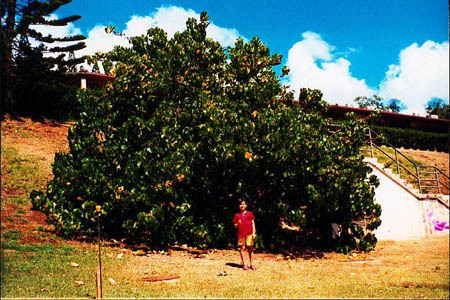 The Trees of Peace at the community center in Kaunakakai, Molokai, 1998. 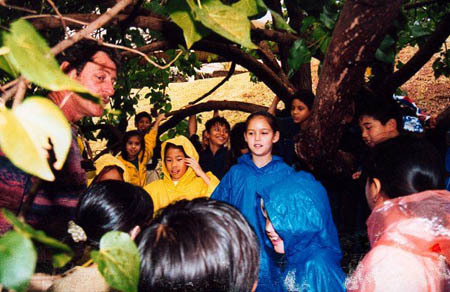 John Stokes talking about the Great Peacemaker with Grade 3 students under the Kamehameha Tree of Peace, 2001. 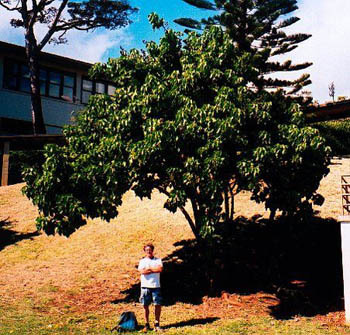 John Stokes with Kamehameha Schools Tree of Peace, O‘ahu, 2002. The Molokai Trees of Peace, 2005. 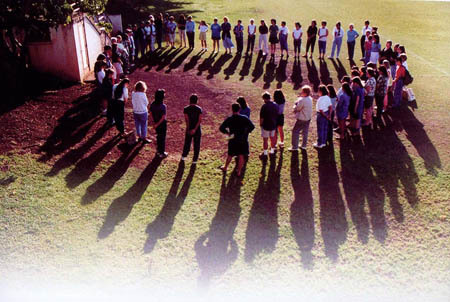 In June 2003, The Tracking Project began a series of collaborative camps, gatherings and trainings with Brother Noland Conjugacion under the name The Tracking Project / Hawaiian Inside (TTPHI) and in 2008, they initiated the first year of a mentor training for Hawaiian educators — Nurturing the Roots. 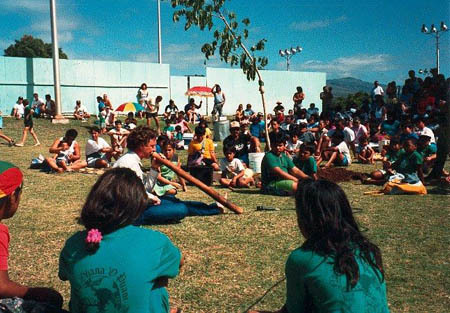 The first year of the gathering was held on O‘ahu at the YWCA facility at Kokokahi. In June 2009, Brother Noland and John Stokes accompanied their mentor group of young artist/educators to the island of Molokai for the second year of their training. 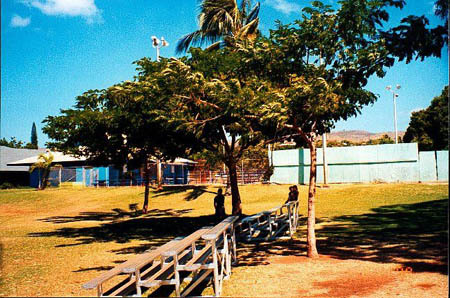 After camping at Walter Ritte’s educational facility at Keawanui and hiking the west end of the island to La‘au Point, the group took part in a peacemaking session on the bleachers under the Trees of Peace in Kaunakakai. Traditional peacemaking plays a large role in The Tracking Project’s curriculum. It was inspiring for the young people to realize how much the trees had grown since the original planting ceremony in 1992. Many of them made personal commitments to plant more Trees of Peace in Hawai‘i in the years to come! The Tracking Project Hawai‘i mentor group with the Molokai Trees of Peace, June 2009. We send our finest greetings and thanks to Jake and Judy Swamp of the Mohawk Nation, to the people of the Iroquois Confederacy for maintaining the memory of the Great Peacemaker and the Tree of Peace ceremony… and to all of our friends, hosts and supporters in Hawai‘i. E mau ana ka maluhia ma Hawai‘i!